Somebody high-five Channel Nine, because the team at 60 Minutes have somehow managed to score themselves an international exclusive with Adele. The soul diva’s feverishly anticipated new album 25 drops this Friday, and now we have a snippet of the potential follow-up to her record-breaking Hello single, thanks to the crafty bastards at the Nine network and their 60 Minutes interview teaser. The clip, which has been uploaded to Twitter, features the songstress performing another song off her new LP, a Tobias Jesso Jr. collab called When We Were Young. And from the sound of things, you’ll be needing a fresh box of kleenex for when this piano-driven ballad baby is birthed in full. Writing in The Observer over the weekend, Adele explained how the collab with T-J-J first came about, saying: “We met up in LA and I absolutely loved him; his vibe, his humour, the way he plays piano – so felt. The music he makes is romantic, with a ’70s vibe. “It turned out he was a really big fan of mine – and he totally kept his cool together, being thrown in the deep end, for our first co-writing session,” she continued. Adele’s new album, 25, will arrive this Friday 20th November. 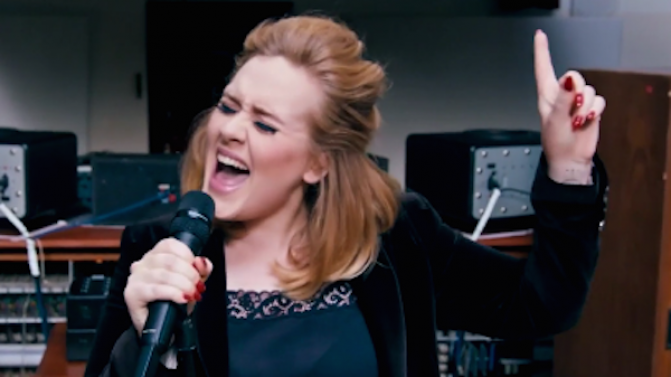 Watch Adele showcase part of When We Were Young in the clip below, but if you want to bypass Nine’s bizarre quick-fire montage of the singer cackling like a demented crow (just look how real she is, guyz! ), skip to the 1.30 mark for the good stuff. Oh and Adele’s full 60 Minutes special airs on Australian TV this Sunday from 8:10pm on Channel 9 btw. UPDATE 18/11/15: Adele’s new song When We Were Young is here in full.